I’ve been meaning to share J’s nursery for quite a while now, but for some reason (and I think a little baby might have had something to do with it), it took me way too long to finally get around to photographing it! As I mentioned before, I was particularly inspired by modern southwestern style when I was putting together J’s nursery. The room was originally a darker mauve color, so we decided to brighten it with a very pale yellow (Benjamin Moore ‘Morning Light’). I wanted it to be light and airy with a few personal touches. I’ve always loved these baby animal prints, but I thought it would be fun to do something a little more personal and include photos of animals from our travels – some from B’s parents’ farm (you might recognize Pretty the cow), others from around Virginia. 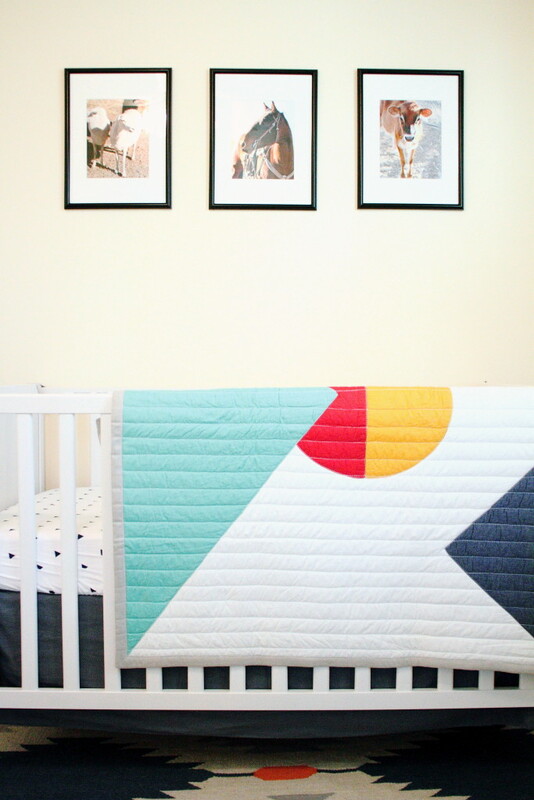 The quilt and sheets are from Land of Nod. 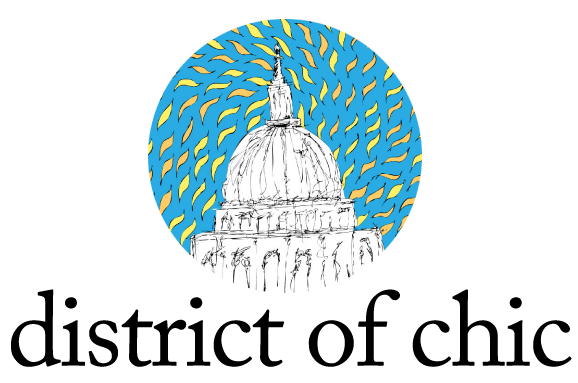 The crib is from Ikea. If there’s one thing I’ve learned since having a baby, it’s that it’s key to have essentials like pacifiers, thermometers, bibs, etc. in easy-to-find places that you can grab while holding an infant. 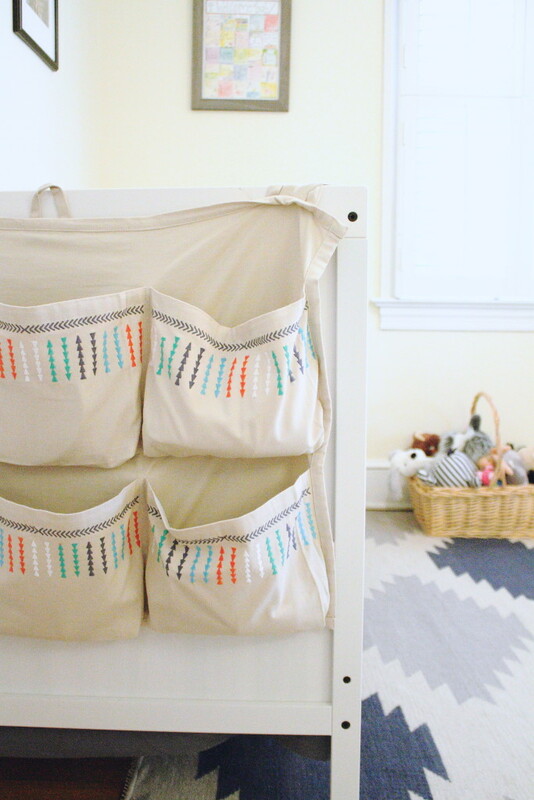 These hanging pockets come in very handy for keeping all the little gizmos and gadgets I seem to acquire organized. 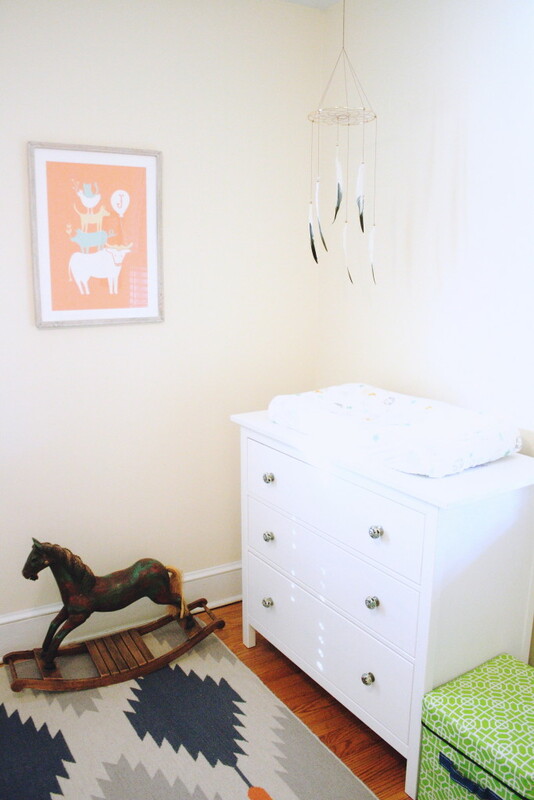 This customized print from Minted fit our farm animal theme perfectly and the rocking horse is an antique my grandmother found in Hot Springs, VA. The dresser is from Ikea, but I spruced it up a bit with these pretty knobs from Anthropologie. The rug is from West Elm. J loves to look at the feather mobile I found on Etsy. It keeps him entertained while I’m changing him. B and I picked out this painting by folk artist Ed Larson on our last trip to Santa Fe and when we found out we were expecting a boy, this seemed like the perfect room to put it in. We found the sheepskin on our trip to Steamboat Springs and the New Mexico pillow was a wedding gift. The fox hamper is by 3 Sprouts. 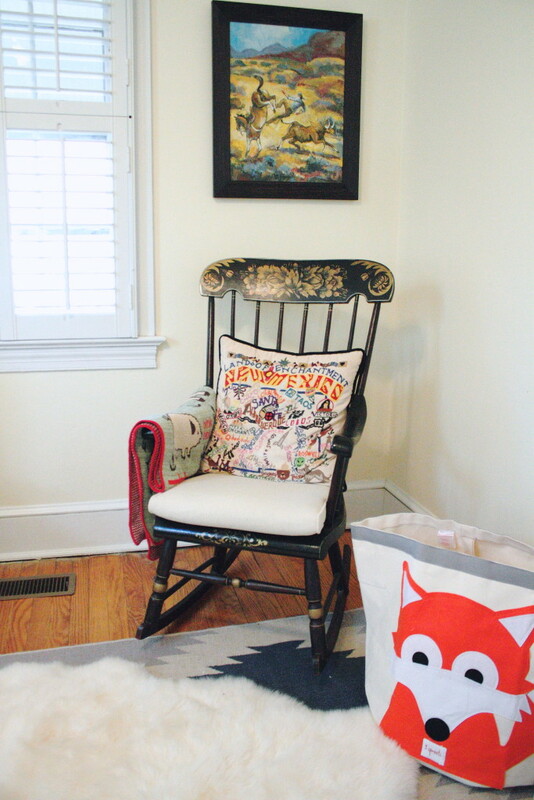 And the rocking chair is an antique that was refurbished and hand-painted by my great grandmother – a beautiful piece that we’re lucky to have! Believe it or not, the adorable goose nightlight was my husband’s when he was a baby – it’s hard to believe it still works 30+ years later! We love reading to J every night so we keep adding to his little library. Right now our favorites are Night Cars, The Snowy Day, and The Little Horse. The rope lamp was a pretty perfect find from Land of Nod. 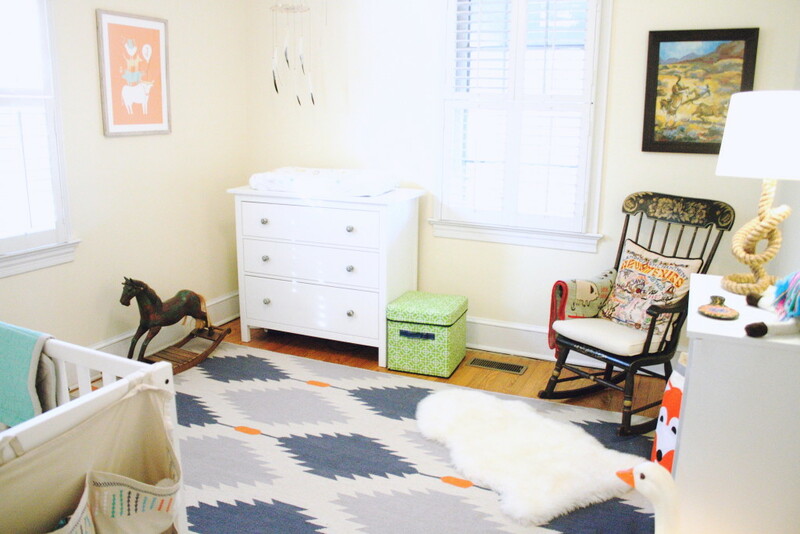 This room has gone through so many different incarnations since we moved in 6 years ago – TV room, guest bedroom, my closet – and now finally J’s nursery. I suspect it will continue to evolve as J develops his own personality and tastes, but for now, it’s a good start! That rocking chair is beautiful! What a great piece! And the room looks amazing! What a beautiful and unique nursery! 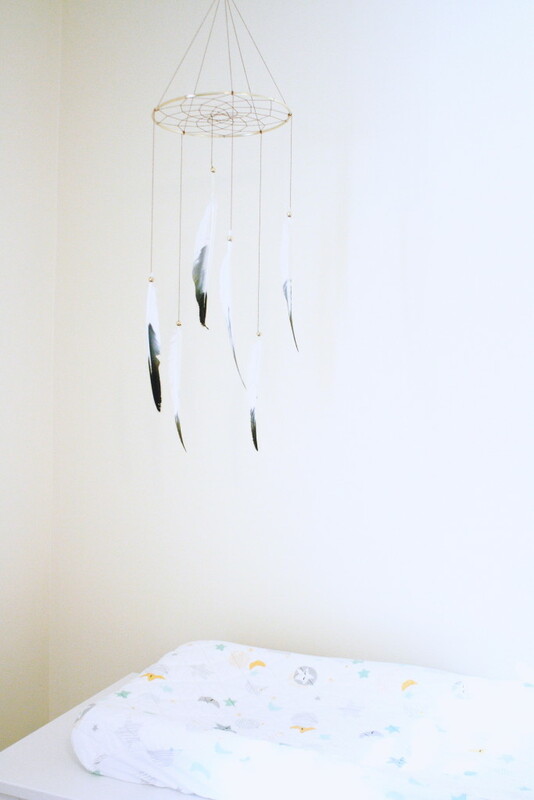 I love the feather mobile! 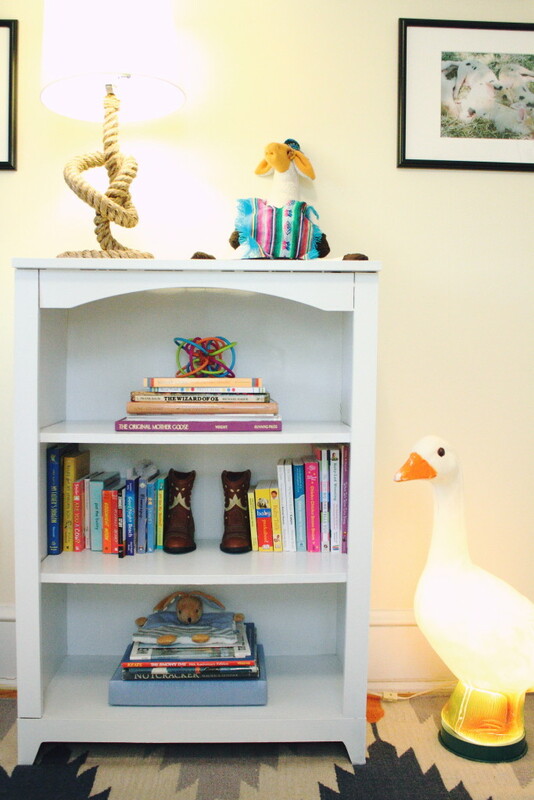 And the rocking chair and the goose nightlight are such amazing pieces. And he is so adorable reading his book! Beautiful post! Omgosh so adorable!! I love the Southwestern theme!